These quilts are from our book, Fresh Picked Posies, which is available as an eBook. Click here to find it at pieceocake.com. Fresh Picked Posies from the book with the same name by Becky Goldsmith & Linda Jenkins. Quilt by Becky Goldsmith, quilted by Mary Covey. 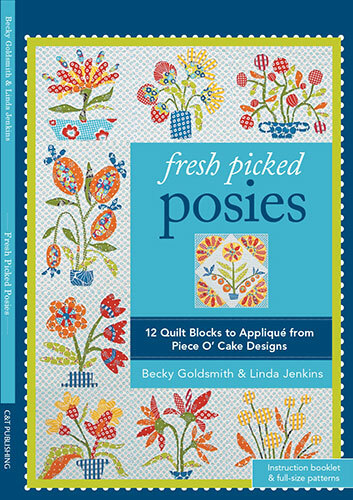 Fresh Picked Posies in an alternate colorway, from the book with the same name by Becky Goldsmith & Linda Jenkins. Quilt by Becky Goldsmith, quilted by Mary Covey. Sunshine Posies from the book Fresh Picked Posies by Becky Goldsmith & Linda Jenkins. Quilt by Becky Goldsmith. I just comleted the applique stage andbtge piecing of Fresh Picked Posies. Now it’s time to quilt it. I plan to out line allmthe applique. What kind of quilting was done in the background? Any suggestions will be greatly appreciated. Hi Gary: My quilt has an all-over pattern that is sort of abstract. The background fabric is busy enough that the quilting pattern is hard to see. If your quilt is the same, that gives you more freedom to pick a quilting pattern. Place some clear vinyl over the quilt top and try doodling until you find a design that you like. And don’t forget to quilt inside the applique as well. The shapes are too large to ignore. Thank you for the great suggestions. My background is very similar to yours. Love the idea about using the clear vinyl. I think I am going to do an all over plume design.